Team VIP's second outing keeps getting more exciting with every passing day. With director Velraj, composer Anirudh, lead hero Dhanush and heroines Amy Jackson and Samantha already on board, comedy actor Sathish is the latest addition to this team. 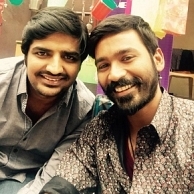 The shoot of this new film would begin in February 2015, by which time Dhanush would have been almost done with Maari. Interestingly, the Kaththi connect keeps getting stronger in team VIP's Round 2, what with the presence of Anirudh, Samantha and now Sathish too. Another blockbuster ahead? Vishal to start an anti-piracy squad? Shankar’s Kappal finds more space to sail! Week-long celebration for Salman Khan! Dhanush And Samantha Are Impressed! The VIP Combo - Dhanush And Velraj, Is Back For Another Blockbuster? People looking for online information on Anirudh, Dhanush, Kaththi, Samantha, Sathish, VIP will find this news story useful.